I am always glad to hear from our readers. This time I noted with pleasure that both comments on baron (see them posted where they belong) were not new to me. I followed all the references in Franz Settegast’s later article (they are not yet to be found in such abundance in my bibliography of English etymology) and those in later sources and dictionaries, and, quite naturally, the quotation from Isidore and the formula in which baron means “husband” figure prominently in every serious work on the subject. No one objected to the hypothesis I attempted to revive. Regrettably, Romance etymologists hardly ever read this blog. In any case, I have not heard their opinion about bigot, beggar, bugger, and now baron. On the other hand, when I say something suspicious or wrong, such statements arouse immediate protest, so perhaps my voice is not lost in the wilderness. Thus, in one of the letters sent to Oxford University Press I was told that my criticism of the phrase short and concise “is not well taken,” because legal English does make use of this tautological binomial, along with many more like it, in which two synonyms—one English and one French—coexist and reinforce each other. What our correspondent said is, no doubt, correct, and I am aware of numerous Middle English legal compounds of the love-amour type. However, I am afraid that some people who have as little knowledge of legalese as I do misuse concise and have a notion that this adjective is a synonym of precise. Perhaps someone can give us more information on this point. I also want to thank our correspondent who took issue with my statement on the pronunciation of shire: my rule was too rigid. I suspect that Mr. Bett (see his comments on the previous gleanings) is an advocate of an all-or-nothing reform. I’d be happy to see English spelling revolutionized, and my suggestion (step by step) is based on expedience (politics) rather than any scholarly considerations. When people speak of phonetic spelling, they usually mean phonemic spelling, so this is not an issue. But I would like to remind everyone that the English Spelling Society was formed in 1908. And what progress has it made in 116 years? Compare the two texts given below. To begin with, I’ll quote a few passages from Professor Gilbert Murray’s article published in The Spectator 157, 1936, pp. 983-984. At that time, he was the President of the Simplified Spelling Society. All this could be written today, even though with a few additions and corrections. English is no longer beginning to serve the purpose of an international language; it has played this role since World War II. We no longer believe that the desired “cleaning” is sure to come: we can only hope for the best. We can see that our educational system is making great strides: what used to take one year now takes two. Mr. Linstead says other things worth hearing of which I’ll single out the proposal. It concerns the formation of an international English Spelling Congress “made up of English speakers from across the world who are open to the possibility of improving English spelling and who would like to contribute to the difficulty of mastering our spelling system.” As I understand it, the reformers plan to pay special attention to organizational matters, rather than arguing about the details of English spelling. This looks like a rational attitude. The public is not interested in the reform. Nor did it show any enthusiasm for it in 1936. There were two letters to the editor in response to Professor Gilbert’s article, but both came from the members of the Society, that is, from the “choir.” If the Congress materializes, it should include a lot of very influential people (what about Lord Bryce’s idea?). Otherwise, we will keep talking for another one hundred and six years without any results. The public, as I said above, does not care about the reform, but it is greedy, covets monetary prizes, and sends children to a torture known as spelling bee. The hive originated in 1925. Here is a case of a bright thirteen year old boy. He speaks English (and to some extent two other languages, one of them learned at home) and is an avid reader. He made it to the semifinals but misspelled ananke (a useful word that reminds even the gods that doom is unavoidable—just what a young boy should keep in mind). I don’t know what he did wrong. Probably he assumed that the word was Latin and spelled it with a c, but alas and alack, it is Greek. For eight weeks a coach (another young student) used to work with the boy three times a week. What a waste! The boy said: “I was really nervous, because you really don’t know what word you were going to get. I wanted to make it farther. [However,] I was really pleased with how I did and how I placed.” I am afraid he will grow up knowing several hundred words he will never see in books and using really three times in two lines. Remembering the spelling of ananke will be the only reward for his efforts. A snake in the slough of despond. 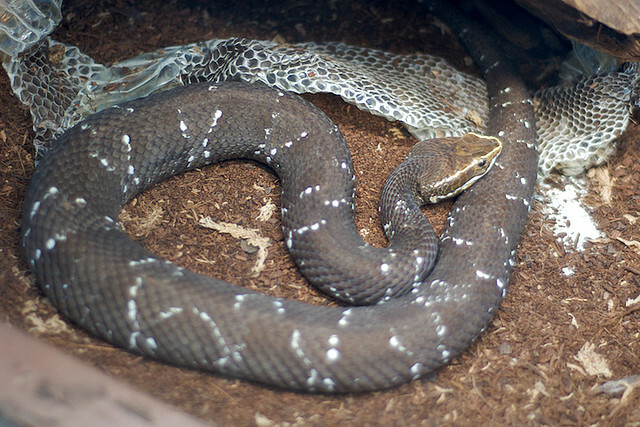 Image credit: A Cantil (Agkistrodon bilineatus) with a shed skin nearby at Little Ray’s Reptile Zoo. Photo by Jonathan Crowe. CC BY-NC-ND 2.0 via mcwetboy Flickr. I think society (society at large, not the Spelling Society) should do what administrators, masters of a meaningless jargon, call sorting out priorities, stop abusing children, forget the fate of the gods, and concentrate on the misery of the mortals who try to make sense of bough, cough, dough, rough, through, and the horrors of the word slough. Checking on the article about ‘slough’, I didn’t see any pronunciations of the dreadful word, though maybe I miss them. We have lots of sloos out in our Prairies, and no doubt you have sluffed off unkind comments about your essays (very few I’m sure), and is there not a place somewhere in England (where else?) called “Slaow”? I’m not much in favour of changing spelling, but possibly ‘slough’ might tilt the balance a wee bit. oh sorry – ‘missed’ them, not ‘miss’. just curious – could Ukraine be related also with something Ugric? In Latvia there is Ukru parish on the border with Lithuania. I haven’t heard this myself but it might mean a hardworking person (ukris), like rūķis for a gnome).